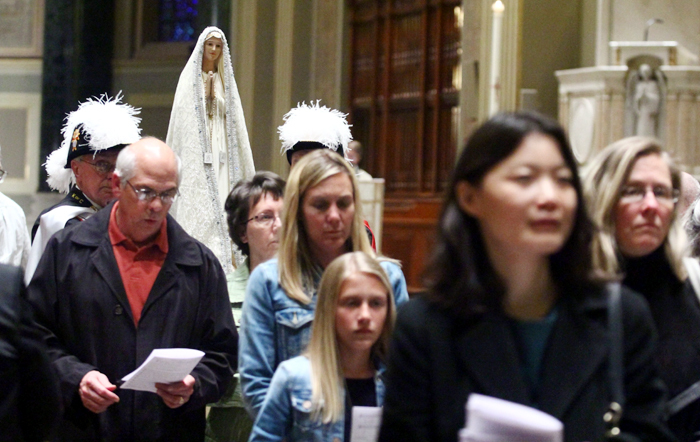 More than 100 families from throughout the Philadelphia Archdiocese gathered Sunday, May 1 for the second annual May procession at the Cathedral Basilica of SS. Peter and Paul in Philadelphia. They marked the month dedicated to honoring the Blessed Mother with Marian songs and chants, a crowning of a statue of the Virgin Mary, and participating in the May Court. In his homily at the Mass for which he was celebrant, Father G. Dennis Gill highlighted the graces that many have received through Mary. He also noted that many parishes have been named in her honor – currently, 48 of the archdiocese’s 219 parishes. He said during this Year of Mercy declared by Pope Francis, those present should reflect on the role of Mary. 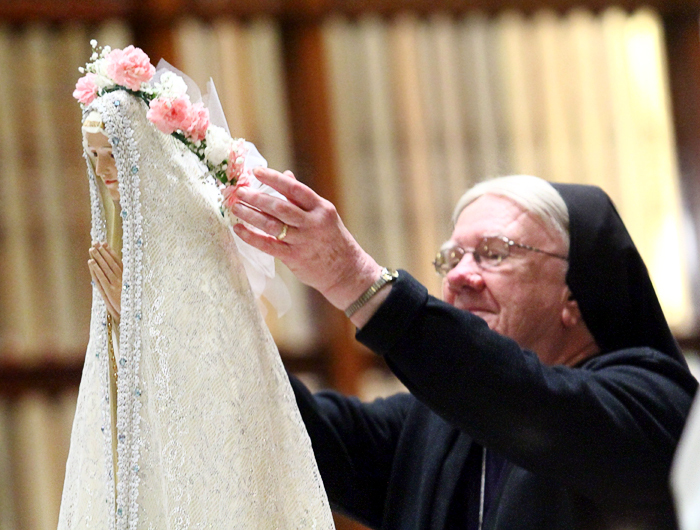 “The Holy Mother intercedes so that we can have that mercy,” Father Gill said. One of the highlights of the day occurred when Sister Irene Loretta, I.H.M., announced the names of those who contributed essays on the theme, “Who is Mary in your life?” Some 20 essay writers were invited into the sanctuary where they received two yellow roses that were placed on the crowned May Queen statue draped in white lace. Among those who wrote essays was 10-year-old Talia Scarpa, a member of St. Thomas the Apostle Parish in Glen Mills. 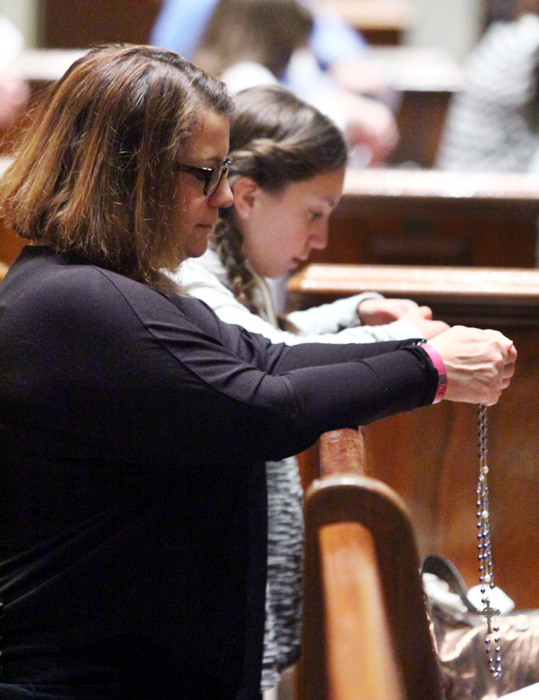 After the Mass her mother, Nancy Condito, was taking photos of her mother, Angelina Scarpa, and daughter Talia. Young Talia was equally exuberant about the May procession. The fourth grader said her grandmother, though wheelchair bound, exemplifies all the positive attributes of Mary. For Jennifer Collins, the procession was a homecoming. Not only does she share her Sept. 8 birthday with Mary, as tradition holds, but her confirmation name too, after the Blessed Mother. So it is little wonder that she came to both the inaugural event of the procession last year and this recent celebration. “This is now my parish since I belonged to Our Lady of Sorrows that closed,” Collins said. “I used to go to St. Charles Borromeo at 20th and Christian. The school there is also closed. So as the parishes were closing I started coming to Mass at the basilica from time to time. “Today, I came with my daughter, whose confirmation name is Marie. Father Gill gave the homily, and he was the one who said I should attend Mass here since I’m always here. Now, I am starting a chapter of the Legion of Mary here,” Collins said. She said Mary has interceded in many of her prayers – including for her daughter who a year ago could not walk. Yet Collins came to the cathedral basilica to pray before one of the Marian statues. On hand for the procession were several members of two chapters of the Knights of Columbus, decked out in their black and purple regalia. Among them was Raymond Hill, a member of the St. Jude Council of the Archbishop Ryan Assembly that serves the eastern part of Philadelphia. He is a member of Our Lady of Hope Parish in the Nicetown section of the city. “It is exciting to be part of this procession because this is part of what we do,” Hill said.